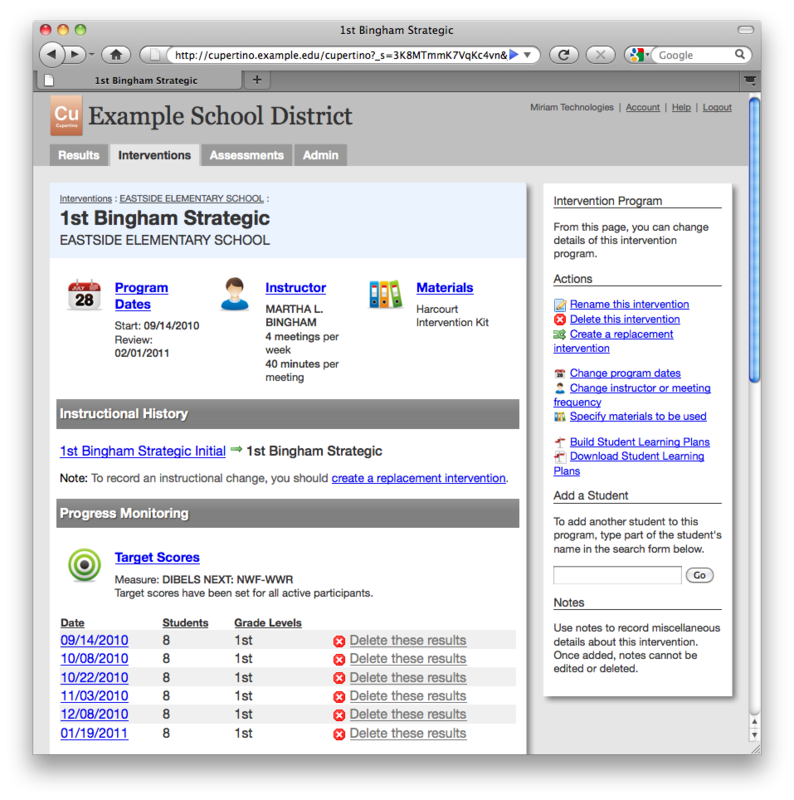 Cupertino logs data about your interventions and tracks weekly student progress. Cupertino lets you log the most important details about each intervention: program dates, instructor, meeting times and durations, and materials used. Each student in the intervention has personalized entry/exit dates and progress monitoring target scores. All of this information is displayed prominently on the intervention page. When you start planning an intervention, you may not know what materials will be used or who the instructor will be. That’s why Cupertino lets you add an intervention without all of those details. Fill in the information you have, and update the rest later. Once students have been added to an intervention, you can choose any measure from your assessment database to use for progress monitoring. Each student has personalized goals, including the grade level, target score, and goal date. Whenever the assessment is given, the score entry page lets you input scores for the entire group or for just a few students at a time. 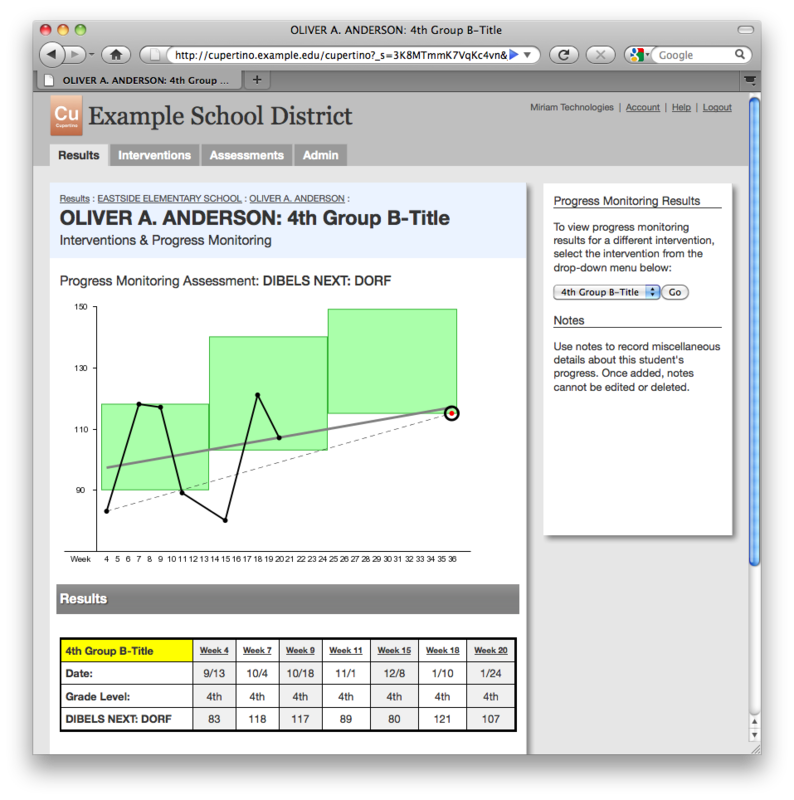 If a student has participated in any progress monitoring, you can view graphs of progress monitoring scores from the student page. 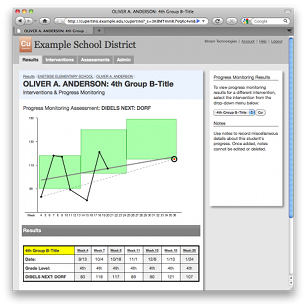 Progress monitoring graphs show the target score, scores that meet standard (according to the score interpretations you have set up), along with goal and trend lines to help you see whether the student is on track. If the materials, teacher, and meeting times or durations are changed mid-way through the intervention, Cupertino helps you create a replacement intervention. The old intervention is ended and all students are seamlessly transferred to the new one. On the progress monitoring graph, these instructional changes are noted with a vertical phase-change line. Grade level changes — when a student starts taking a progress monitoring test for a different grade level — are also marked with a phase change line. Copyright © 2011-2016 Miriam Technologies, Inc. All rights reserved. Cupertino™ is a service of Miriam Technologies, Inc.